Easily incorporate decorative outdoor lighting into your outdoor lighting design and make it your own. As they say, beauty is in the eye of the beholder and that of course holds true for outdoor lighting. Personality can be expressed through your own unique style which you can use to accentuate your personality with the help of decorative lighting. Before going out and buying your outdoor lighting fixtures, lets create a plan together and get you ready for the first phase of your outdoor design project. Hidden fixtures provide lighting without drawing too much attention to themselves which takes the spotlight away from whatever your lighting is showcasing. Some may have dull or dark finishes to help blend them into their surrounding environment while recessed outdoor lighting fixtures are partially hidden from view and are often flush mounted. Decorative fixtures are meant to be seen and should be positioned in a way that they'll be easily viewable from afar. 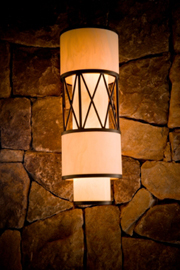 Manufacturers make a variety of decorative outdoor lighting fixtures which come in many different finishes. It's really a matter of choosing the best decorative fixtures that fit both your personality and your outdoor space. Deciding between the anique look of brass outdoor lighting or modern look of contemporary outdoor lighting is all part of the fun. Maybe you've decided that you want your decorative lighting to be a little different and more creative. You can really dress up your outdoors with the use of outdoor string lighting. If string lighting is not for you, the use of outdoor rope lighting is an easier alternative you can use that you can't mess up. Choosing decorative fixtures doesn't have to be an uphill battle. There are three simple things to consider before deciding on the perfect fixtures. Are there any unique qualities about your outdoor space that you really love? Is there anything you don't like about it? Take a step back and really examine it. Are there any repairs you want to make in the near future? How about some simple modifications you want to implement such as adding outdoor path lighting? Do you have a certain layout you want to compliment? Write all of this down on a piece of paper as you walk through and examine your outdoor space. Then write down all the things about your outdoor space that you think could use some improvement and the things you could do without. When choosing decorative fixtures, consider your personal style. The unique things that make you who you are can be incorporated in your decisions when purchasing the decorative fixtures fit for your lighting project. Remember to keep your personal style consistant. Stick with one style that you like and allow it to flow. A copper outdoor lighting fixture for example may not jive well with the look of a modern powder coated fixture. If your personal style is not consistant with your outdoor space's unique charm and character, you may need to be a little flexible. Find fixtures that fit your outdoor space's charm and incorporate your personality into the theme of your decorative outdoor lighting design. Look around at your existing environment and use it as inspiration for the theme of your decorative lighting project. What style architecture is your home? A modern style home would benefit with modern outdoor lighting design. What style homes or buildings surround you? Are there any prominent landmarks that you could integrate into your lighting project? Think about the natural environment around your outdoor space's exterior for inspiration. For example, if you live in a tropical environment you might like to incorporate tropical outdoor lighting into your outdoor space and play on the natural theme already present around you. Take a ride to your local home superstore. Its a great way to physically see the decorative fixtures and really compare their similarities and differences. If you find something you like, write it down. You may be able to find a bigger selection online but its always a good idea to at least look around. Its a great way to get a good feel for things. Check out a lighting specialty store. These stores specialize in all types of lighting products and will usually have a much broader selection to choose from than home superstores. Its also comforting to know that the personalized help you need for your outdoor lighting project is available from professionals that know a lot about lighting. This can be an invaluable source of information in the long run and may even help you avoid any unforseen problems or mistakes you might not have been aware of initially. Decorative light fixtures come in a variety of different shapes and sizes, so you'll want to make sure whatever decorative fixtures you choose compliement each other. Each lighting manufacturer produces their fixtures a bit different from the next, sometimes making it hard to match up the same colors and textures. It's best to purchase your decorative outdoor lighting fixtures from the same manufacturer. That way you can be sure to match the fixture style, colors, and finish exactly.